Death of a Queen (1935) was Christopher St. John Sprigg's sixth detective novel and the last one to be published before his life was cut short in the Spanish Civil War, The Six Queer Things (1937) appeared posthumously, which probably accounts why this particular title has become such a rare, hard-to-find item – a scarcity further exacerbated by the fact that the book was never released in the U.S. Fortunately, Black Heath has recently reissued Crime in Kensington (1933) and Death of a Queen as inexpensive ebooks. So you can now pick up this once rare and pricey collector's item for a mere pittance. Death of a Queen marks the fourth and last appearance of Charles Venables, a detective-turned-journalist, who climbed the career-ladder in Crime in Kensington from gossip columnist to the star crime-reporter of the Mercury – demolishing a criminal plot and an impossible disappearance in the process. However, Venables has a very different role to play in his last recorded case. Venables is summoned by Superintendent Manciple of Scotland Yard and finds him there in conference with three other men. Mr. Lancelot of the Foreign Office. A Mr. Shillingford and his right-hand man, Luigi, but Venables makes an educated guess and assumes "Mr. Shillingford" is a pseudonym. So he addresses Shillingford as Your Royal Highness. An obvious nod to the opening of Conan Doyle's "A Scandal in Bohemia" (The Adventures of Sherlock Holmes, 1892). Mr. Shillingford is His Royal Highness Augustus Crispin Maximilian, Crown Prince of Iconia, who has come to Britain to ask for help on behalf of his mother, Queen Hanna. 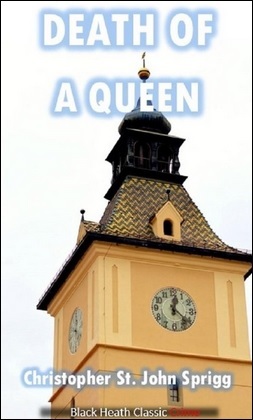 Lately, Queen Hanna has turned from an elderly, strong-minded and bad-tempered lady into a "badly scared old woman." Manciple has recommended Venables to the Foreign Office as someone "possessed of some experiences" in discreet investigations and is asked "to look into certain events which have occurred" at the palace. So Venables is bound to the capital of the tiny kingdom, Isorb. I think most readers here will probably have the same reaction as Venables, "sounds dreadfully like Ruritania," but Sprigg makes it clear to the reader that Iconia is not Ruritania. One of the most impressive aspects of the story is the back-story of this fictitious Balkan kingdom, which has its own language, culture, history and historical figures who helped shape the country – a kind of world-building that reminded me of the imaginary micro-nations from Peter Dickinson's The Poison Oracle (1974) and James Powell's A Pocketful of Noses (2009). However, Sprigg took a more realistic approach with this fictional kingdom and depicted the place with one eye fixed on the real world. Iconia is an isolated pocket of a land, "as big as Yorkshire," trapped between the Danube and Transylvanian Alps. The present ruling dynasty, the Herzvogins, are supposed to be "descendants of those original noble brigands" and the present monarch, Queen Hanna, has been on the throne for nearly thirty years. Queen Hanna came to power during "the agrarian troubles" resulting in the Distribution Act of 1904 when the Crown lands were broken up and given to the peasantry, which meant that the palace has been run ever since a shoe-string budget. Venables is given to understand that he expected to pay for his meals and drinks. They still have the revenue from oil royalties, but, entirely coincidental, it "exactly equals the interest and amortization" on the British loans to Iconia. You sure know how to cut a deal, you cheeky Brits. Venables speaks with Queen Hanna a day before the thirtieth anniversary of her accession to the throne and she has received an anonymous letter warning her to give up her foolish plan. And reminding her of the "Doom of the Herzvogins." A family curse the Herzvogins inherited from the second King of Iconia, Augustus the Clerk. However, Queen Hanna is determined to reveal a great secret on her anniversary, but she never gets to make her proclamation. Queen Hanna is strangled to death under seemingly impossible circumstances in her Royal bedchamber. There are three doors to the Royal suite and two sentries were posted at each door, who stood guard until midnight when they were relieved, but they claim nobody entered or left the room during that period – as if "the murderer was invisible." Unfortunately, the explanation to this locked room trick is unlikely to excite people who obsessively read impossible crime stories. And... I liked my solution to the problem of the guarded room slightly better. When the circumstances of the impossible murder were presented, it immediately occurred to me that there were two weak links in the security revealing an unguarded path to the Queen: 1) a room with three doors 2) the young, inexperienced guards. Queen Hanna even demonstrates to Venables the unprofessionalism of her guards when she takes a potshot at a sleeping sentry in the courtyard and, when a minute later, frightened men storm the room, she coldly informs that she "should have been dead by now." So this gave me an idea. The bedchamber has three doors and you have to assume those doors open in three different portions, rooms or corridors of the palace. So what if two assassins, dressed as sentries, come to relieve two of the guards 10-15 minutes earlier. We already established discipline is something to be desired in the palace guards and probably would not object to be being relieved earlier than planned. And that's if they even noticed the 10-15 minute time-gap. The murderers enter the bedchamber to do their dirty work and take their place as sentries when they come out again. At midnight, they're relieved by the actual guards and they simply walk away without a hint of suspicion – shedding their uniforms as they vanish inside the palace. I honestly think it's better than Sprigg's solution. Well, it would have made for a good false solution in any case. Anyway, the murder in the Royal bedchamber is not the only inexplicable occurrence in the palace that night. Queen Hanna was seen in the State Office when by all "the laws of logic she ought to have been dead" and another frightened palace guard had opened fire on the ghost of Her Majesty walking down the stairs with either "the devil or St. Boron." A second quasi-impossible crime happens when an attempt is made to poison the newly crowned King of Iconia, Augustus X. The only person who could have poisoned the drinks is an important witness, Dr. Robor, whose loyalty to the queen extended beyond the grave, but these are not the only pieces of the puzzle and Venables has to dig deep to unearth all of the pieces of the puzzles – comprising of old rivalries, dead royals, long-kept secrets, remorse and an exhumation. Sprigg handled all of these intertwining plot-threads with great skill and the flick of the tail provided the story with a twist that slightly gutted my solution. And that's always a nice surprise. 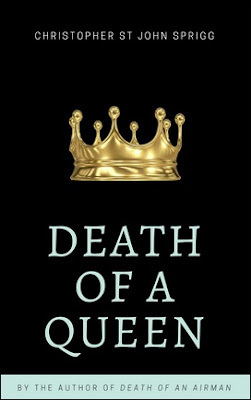 So in terms of plotting, Death of a Queen is unquestionable the best one I have read to date, but equally good is the story-telling that wove the history of an imaginary kingdom together with the plot-strands of a good, old-fashioned detective story – which made for a thoroughly enjoyable read with an unforgettable setting. A detective story that makes you want to shout out, realism be damned! Absolutely recommended! Hopefully, Black Heath will not let us wait too long for Fatality in Fleet Street (1933), The Perfect Alibi (1934) and The Corpse with the Sunburn Face (1935). I think this story shows just how flexible a format the fair play mystery can be in telling a story; you can tell just about any type of story within its rules. The fair play aspect forces a necessary discipline on the structure of the story so you get a better story. Of course that requires more effort and skill than the moderns want to spend. Absolutely! I've said the very same thing years ago. You can drop the traditional, fair play detective story in practically every genre of fiction and make it work (science-fiction, westerns, romance, historicals, etc). But as you said, it does require some work in order to get it right. Asimov's The Caves of Steel is perfect example of the hybrid-detective done correctly. A plot complete with false solutions that perfectly fitted the world that Asimov had build up in the story. Only fantasy is a bit tricky to mesh with the traditional detective (e.g. Randall Garrett's abysmal Too Many Magicians). However, it can be done. Mike Resnick's wrote a short series, titled Fables of Tonight, which transplanted the iconic hardboiled detective to a fantasy realm populated with dragons, witches and vampires. I suppose private-eyes are better suited to deal with fantastic creatures (e.g. Who Framed Roger Rabbit?) than their colleagues who rely on their reasoning and deductive abilities. Shame this one is not available as a print version, as I'm not the best at reading from the screen. Hope this moonstone press actually happens at some point. "...unquestionable the best one I have read to date..." Wow! I've had a copy of this book for years now and almost read it back in the summer. Then I got distracted with Jean Potts and a huge project related to her books. I must make sure to get to this book later this month. Thanks for the tempting review. You're welcome, John! I hope you'll enjoy it and look forward to your review later this month. This one was so rare I never found a copy! Best book of the others for me was The Perfect Alibi. Who did the second pictured edition? The second cover comes from the Moonstone Press edition, which was slated for release in September, but that publication never materialized. THE CORPSE WITH THE SUNBURNED FACE has been available on kindle for several years.